Owing to the issues with GSTR online portal and much to the relief of tax payers, the due date for filing of FORM GSTR-1 has been extended vide Notification No. 71/2017-Central Tax and 72/2017-Central Tax dated 29th December 2017. The previously announced due date of 31st December 2017 has been extended to 10th January 2018. The relief has been provided to assessees with aggregate turnover upto 1.5 crore as well as those with aggregate turnover over 1.5 crore. Last date for filing of Monthly return in FORM GSTR-1 for for July-September , 2017 for Registered persons having Aggregate turnover of up to 1.5 crore , has been extended to 10thJanuary, 2018 from earlier due date of 31st December, 2017 ( NotificationNo.71/2017 ). Last date for filing of Monthly return in FORM GSTR-1 for for July-October, 2017 for Registered persons having Aggregate turnover of more than Rs 1.5 crore , has been extended to 10th January, 2018 from earlier due date of 31st December, 2017 ( Notification No.72/2017 ). GSTR-3B return will have to be filed by all taxpayers in addition to GSTR-1, GSTR-2 and GSTR-3 return.Earlier, GSTR-3B returns were to be filed for the month of July to December 2017. IN 23rd council meeting, it has been announced that GSTR-3B return must be filed for all months from July 2017 to March 2018. The due date for GSTR-3B return will be the 20th of every month. In addition to the waiver of GST Return Penalty, the Government has also announced a reduction in GST return penalty for NIL GST returns. From October 2017, the GST return penalty for not filing NIL GST return has been reduced to Rs.20 per day instead of Rs. 200 per day. In 22nd GST Council, it has now been decided that taxpayers having annual aggregate turnover up to Rs. 1.5 crores will not be required to pay GST at the time of receipt of advances on account of supply of goods. As per E-Way bill rules, any transportation of goods with a value of more than Rs.50, 000 would require an e-way bill. 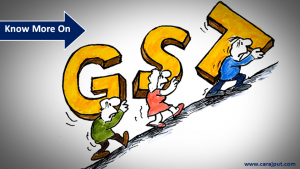 The GST council in earlier meeting in October had decided that E-way bill would be introduced in staggered manner from January 1 and subsequently nationwide from April1. In the recent 24th GST council meeting was finally decided that the e-way bill is now introduced and will be applicable from 1st February 2018 across the nation. The nationwide e-way bill system will be ready to be rolled out on trail basis latest by 16 January 2018. Trade and transporters can start using thi system on voluntary basis from 16 January 2018. Registration under GST was mandatory for entities undertaking inter-state supply of goods and/or services, irrespective of aggregate annual turnover.In the 22nd GST Council, it has been decided to exempt service providers from this condition. Hence, service providers will now be allowed to undertake inter-state sales of upto Rs.20 lakhs without obtaining GST registration.Further, this is exemption is also available for service providers supplying services through an e-commerce operator. Person opting for composition scheme was restricted from providing any exempted/taxable service .but now a composite can provide exempted service also. In 23rd GSTcouncil meeting the due date for enrolling under the increased threshold has been made available to both migrated and new taxpayers up to 31.03.2018. The GST rate payable by GST Composition dealers has been harmonized for all taxpayers (traders or manufactures) at 1%. However, not change has been announced on the GST rate for composition scheme for restaurants. Registered taxpayers were required to pay GST on reverse charge basis when they purchased from an unregistered person, the 22ndGST Council has decided to suspend the reverse charge mechanism till 31.03.2018. Now, registered taxpayers can purchase from unregistered persons without having to pay GST on reverse charge basis. The Government has decided to postpone the TDS/TCS registration and operationalization to 31st March 2018.